I normally don't review books related to one person's mystical visions unless they have been endorsed by the Church, but in the case of Visions of Purgatory: A Private Revelation , I am making an exception. Why? 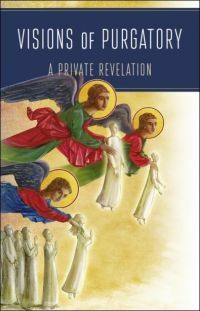 First, the book has a preface by Bishop Henri Brincard, Bishop of Puy in Velay, France, who states, "I would like this account, beyond its particular form, to revive devotion to the souls in purgatory and promote beneficial reflections." Second, the book is published anonymously. No one is seeking to get famous off of these revelations. Third, there is nothing in this book that contradicts anything that saints have told us about their own visions of purgatory. The book is extremely well annotated to emphasize that fact. Four, like Bishop Brincard, I want to help people understand how important it is to pray for souls who have died. So many times, at a funeral, people will talk about how someone is in heaven. I know it is comforting to think that, but the simple truth is that we don't know. That person may be in desperate need of our prayers. When I die, I want people to pray for my soul! It is an act of love to pray for our family members and friends who have passed on before us and to have Masses offered for them. We can have Masses offered even for those who were not Catholic. We also should pray for the souls in purgatory who have no one to pray for them. This is part of our responsibility as a member of the communion of saints. Almost everyone who is ultimately destined for heaven (that's the good news) spends some time in purgatory. This includes children who have reached the age of reason, members of every faith, priests, and religious. Even many canonized saints have spent some time in purgatory. While we should do all we can to avoid sin and do penance here on earth, we have to be made perfect before we can enter heaven. All the vestiges of sin need to be purged. "Purgatory was created by mercy - the souls are in purgatory by a decree of mercy and the pure gratuity of divine love. For these pains, no matter how terrible they are, are very slight in relation to the offense that sin constitutes." I encourage you to read this book. It offers a real glimpse of what purgatory is like. Even if you don't read it, however, please remember to pray for those who have died every day. That is the most important take-away from this book. As much as I hate to admit it, this has been a summer of waiting for the school year to begin. While we have definitely had a good summer and tried to enjoy it as much as possible, the stress of this looming year has been hanging over all of us, because this is the year that everything seems to be changing. The boys' homeschooling friends are all heading off to different high schools, which is great for them, but leaves us plotting our own path. I wrote at the beginning of the summer that I was stressed out about planning for my 9th graders high school. I did manage to take several deep breaths, read High School of Your Dreams from Catholic Heritage Curricula, did loads of on-line research (some of it while working on my Today's Catholic Homeschooling site), talked to him about what he wanted to study and came up with a plan. His year is going to involve: English, Math, Botany, Religion, World History, Computers, and Spanish. He will also be taking three acting classes, providing him with much-needed time with other teenagers. Acting is is his passion and at least for the moment, what he wants to do with his life. He knows he'll probably need another job to pay the bills and he doesn't mind working behind the scenes at a theater, but he is good at acting and his various skills seem to shine in that realm, so we will encourage this venture as much as we are able. My 8th grader is going to a new alternative school for teens three days a week. He has wanted to go to school, but was not interested in a five-day-a-week traditional school experience, so this new school really seems like an answer to my prayers. The students there are self-directed learners. There are set classes they can choose to take or they can arrange for independent study. There are also community service opportunities. The classes run for eight week blocks. For the first session, he is taking Finance and Shakespeare and hopefully there will an independent study for him for geometry. If not, we'll work on that at home. He's also going to be doing Botany, History, and Religion on the two days he is at home, and will be taking one acting class as well. It's not his passion, but he does enjoy it, and it is an excellent creative outlet. My goal for the older boys is to work on organization and time management. To that end, I plan to give them their assignments on a weekly basis and have them figure out when they want to get them done. I have the first week all typed up and ready to go. My daughter is taking part in a homeschool co-op for pre-school one morning a week. She's going to have religion, science, music, and gym. She also goes to gymnastics class once a week. At home, we're still working on the basics - numbers, letters, writing her full name - that sort of thing. She is definitely a kinesthetic learner with an abundance of energy. There's nothing she can't climb and swing on. I'm thinking a indoor mini-trampoline will be a must for this winter. So, that's the plan. School starts Monday. We shall see how it all plays out. 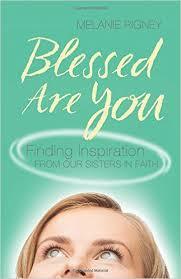 Blessed are You: Finding Inspiration from our Sisters in Faith by Melanie Rigney examines each of the beatitudes from the Gospel of Matthew and offers the example of four female saints or blesseds who put that beatitude into practice. Living the beatitudes are "a way to follow Jesus. They lay out an exceedingly difficult way to live," but these women show us that it is doable." As Rigney emphasizes, some works of mercy are fairly easy to perform, while others may require an incredible amount of self-sacrifice. Yet, despite the amount of effort utilized to carry out these works of mercy, it is important to remember that "whether it's a corporal or spiritual work, there's no quid pro quo here through which we offer mercy and then the recipient cries and tells us what great Christians we are. Often, our offering will be ignored, scoffed at, or denigrated. That doesn't matter. We offer mercy because we love God; we love the person no matter how appreciative or unappreciative he or she is of the offering; and we love ourselves. We offer mercy because God has given and continues to give it to us without reservation or limit." Rigney offers Mother Teresa, Maria Korlowska, Frances Xavier Cabrini, and Elizabeth Canori Mora as role models for this beatitude. While Mother Teresa and Frances Cabrini are well-known, Maria Korlowska and Elizabeth Mora are probably new to you. Maria founded the Sisters of the Good Shepherd of Divine Providence, a community devoted to those who were lost morally, especially prostitutes. They helped these women learn marketable skills so that they could support themselves and provided medical care for any STDs they might have had, as well as providing religious instruction for any who might want it. While she did minister to the poor, Elizabeth's main venue for carrying out works of mercy was within her own family, offering a role model for those who suffer in difficult marriages. "She did a lot of praying" especially for her wayward husband. While she didn't live to see it, he reformed his life after her death, eventually becoming a Franciscan priest. We are all called to perform works of mercy every day. For mothers, those acts are often within one's own home, but whether we are ministering to our own families or going out to minister to the world at large, we must always remember to act out of love. We show others mercy because God has shown mercy to us, and we are called to love our neighbor as ourself. 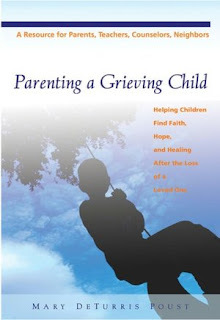 Please note: A new revised edition of Parenting a Grieving Child has just been released. This review is of the 2002 edition. Parenting a Grieving Child was recommended to me by Heidi Hess Saxton as a reference for helping children who are in foster care or have been adopted. All of these children are grieving to one degree or another. This book by Mary DeTurris Proust does not deal directly with that sort of grief, but it should be required reading for all parents because at one time or another, all children grieve, and how we help them to cope with that grief is very important. The loss may seem relatively small, like that of a goldfish, or huge such as losing a parent or sibling, but every child grieves every loss "on his or her terms." Just as for adults, there is no one right way to grieve, and what seems like a small loss to us may be extremely important to a child. We must guide them through the process. Proust offers suggestions on talking about death and emphasizes the importance of telling children the truth about what has happened in an age-appropriate manner. She also provides a list of symptoms and behaviors that grieving children may exhibit, and red flags that professional help is needed. Faith is an important component of this book. "We cannot separate our faith from our grief and mourning." What we believe about God and the afterlife will have a huge impact on how we and our children grieve. We need to offer spiritual support to our children, especially as they question how God could allow such pain and tragedy. "Faith offers a kind of support that cannot be found anywhere else." Parenting a Grieving Child is a very valuable resource, perhaps best read when one is not in the midst of grieving, but rather as preparation for the inevitable. In addition to parents, it would be helpful for educators and those who work with children in a pastoral capacity. Blessed are You: Finding Inspiration from our Sisters in Faith by Melanie Rigney examines each of the beatitudes from the Gospel of Matthew and offers the example of four female saints or blesseds who put that beatitude into practice. Living the beatitudes are "a way to follow Jesus. They lay out an exceedingly difficult way to live," but these women show us that it is doable. Also, the beatitudes are in the present tense." Rigney reminds us that the beatitudes are in the present tense. "You are blessed now, today and always, just like the women on these pages." Rigney also offers reflection questions and concrete ways to put the beatitudes into practice in our own lives. "Blessed are You" offers the opportunity to learn about some female saints and blesseds you may not have had the pleasure of encountering before, while giving you a roadmap of how to live a more Christ-like life. The Spiritual Exercises are a silent retreat based on the well-proven method of St. Ignatius of Loyola. The Priests of Miles Christi, devoted to the preaching of these Ignatian retreats, frequently offer them in a weekend format. Throughout the centuries, the Spiritual Exercises have shown to be an excellent means of sanctification, highly praised by Popes and Saints. The calendar says August and the first day of school and all the craziness that accompanies it is looming just over the horizon, but I refuse to relinquish summer. August deserves to be enjoyed for the month that it is, and not just a prelude to fall, which means there is still time to put up one's feet (preferably by the water), sip a cool drink, and enjoy a light, enjoyable read. If you happen to enjoy Jane Austen, I have just the book to recommend. 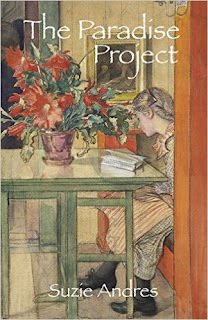 Suzie Andres, a veteran homeschooler and non-fiction writer, treats us to her first novel, "The Paradise Project." A work in homage to the beloved Austen, this is a modern tale of romance and manners, with some comedy thrown in for good measure. Elizabeth Benning is in her early 30s, recently unemployed, and in search of a New Year's Resolution. Her brother-in-law Pat (married to Elizabeth's older sister Jane) takes great joy in teasing Elizabeth and having her fail. She had been given two books for Christmas, "The Happiness Project" by Gretchen Rubin and "Never Too Late" by John Holt. Having read nothing but the titles of either book, she came up with the "Never Too Late for Happiness Project." Pat suggests that she come up with one activity each month as well as help him with the "Fra Angelico Series" of events that he runs at the local Catholic college. The novel follows Elizabeth through the trials and travails of each month, made all the more challenging by the appearance of two blonde newcomers - Ralph and Gretchen. This is a fun read with, of course, a happy ending. Andres is a talented writer who one hopes will grace us with more Catholic fiction in the future. I had seen the romantic movie "Old Fashioned" promoted on my Facebook feed a few months back when it was in theaters, but I don't get to the movie theater much, so I needed to wait for the DVD to come out. It was not what I expected at all, but I was pleasantly surprised. Clay Walsh is a former wild frat boy who has abandoned that life in favor of a quiet role as the owner of an antique shop who has very strict rules when it comes to dating. He refuses to be alone anywhere with a woman and wants to reserve even kissing for marriage. Amber Hewson is a free spirit who rents the apartment above his shop. The characters struggle to develop a relationship and learn valuable lessons about themselves in the process. It is rated PG-13 and rightly so - there are several conversations about sexuality and both the characters have less than ideal pasts. This movie is a real conversation starter when viewed with teens. One can discuss various ideas and ideals about dating and courtship. While Clay takes an extreme view, this is one area where it is certainly better to err on the side of caution than take the opposite path. It also has important messages about mercy, forgiveness, and being able to start over even when one has made some very poor choices. While certainly not the best movie ever made, it is a good story with some laugh out loud funny parts and a quality message. Definitely worth seeing and discussing with teens and young adults.